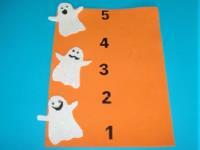 Use it for Halloween night or leading up to October 31st to evaluate children's level of fear. 1. Gather your material. You will need orange, white, and black Fun Foam, tiny wiggly eyes, an orange pipe cleaner, scraps of felt, a hole-punch (not shown), white cardboard or construction paper, a permanent marker, white glue and/or hot glue, scissors, a paperclip, number stickers, and an adhesive magnetic strip. 2. 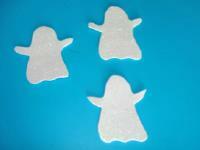 Cut three ghost shapes out of the white Fun Foam. 3. Cut two identical arrows, one out of felt and one out of white cardboard. 4. 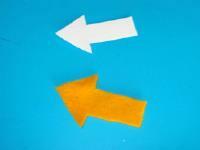 Glue the two arrows together. 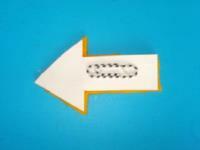 Glue the paper clip behind the arrow, on the white cardboard. 5. 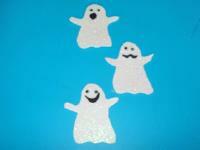 Glue two wiggly eyes on each ghost. Cut three tiny mouths out of the black Fun Foam: a smiling mouth that will indicate that the child is not afraid at all, a squiggle-shaped mouth that will indicate that the child is unsure of his/her feelings, and a round mouth that will indicate fear. Glue the mouths on the ghosts. 6. Glue the smiling ghost in the lower left-hand corner of the sheet of orange Fun Foam, the ghost with the squiggle-shaped mouth halfway up the left-hand side, and the ghost indicating fear in the upper left-hand corner. Stick numbers 1 to 5 in the centre of the Fun Foam sheet, placing number 1 at the bottom and number 5 at the top as shown. Count with children as you add the numbers. 7. 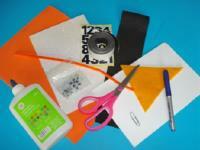 Glue the magnetic strip on the right-hand side of the orange Fun Foam sheet. 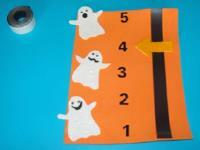 Show children how they can slide the arrow up and down the magnetic strip to indicate how comfortable they are with the various Halloween activities presented. 8. 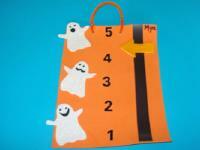 Use the permanent marker to write the child's name at the top of his/her barometer. Using a hole-punch, make two holes at the top of the barometer. Thread the pipe cleaner through the holes to create a hook. Hang the barometer within your daycare. Happy Halloween!